I've added large opaque red drops inside each frame, and used matching small red beads to dangle the frames from ornate vermeil (14 kt gold plated over sterling silver) post earrings findings. Surprisingly lightweight for all their size, they're the perfect earrings for casual summer wear. 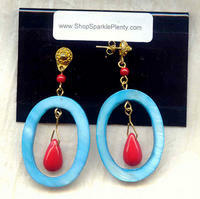 It's another light and bright bit of ear-candy from SPARKLE PLENTY.